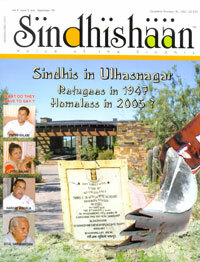 After a short gap I have received a complementary copy of Sindhishaan April-June 2005. Previously perhaps I was receiving Sindhishaan as a member of NCPSL but I am not a member NCPSL now after the change of guards at Delhi. I will however like to subscribe for your magazine rather than have a complementary copy. I appreciate you love and respect for me but I would certainly like to pay, therefore I am sending herewith a cheque of Rs. 600/- as subscription for 2 years please accept. The only answer can be that we were caught by the decision of the then Congress Committee for accepting unfortunate partition of the country on 3rd June, 1947. What can I do now to strengthen myself and my community? The answer is we can definitely do a lot by awakening our community against the injustice to us and try for Akhand Bharat. It requires some sacrifice on our part of devoting time for such awakening. Second article of Shri Arun Babani is also very good (WHERE IS MY DARGAH!) Shri Babani laments that Sindhis community though is not dying but it is evaporation of a shallow and rootless life. It is a snapping of ties, cutting off connections with heritage, with history. Let me remind Shri Arun Babani that in case we remember the history of partition and hope that some day Bharat will be Akhand our dreams of being by the side of Dargah will come true. "हे भगवान मेरे जन्मदिन पर स्वतंत्रता का उपहार मिला किन्तु कैसी कटीपीटी स्वतंत्रता? मैं इस उपहार के बिना भी ठीक था। आज नहीं तो कल किसी न किसी रूप में, किसी न किसी तरीके से इस विभाजन को जाना ही होगा। भारत की आत्मा एक और अखंड है और जब तक उसका बाह्य शरीर भी अखण्डता प्राप्त नहीं करता, हमारी स्वतंत्रता अधूरी, अपंग और अर्थहीन बनी रहेगी। इतना ही नहीं हम फिर से गुलामी की ओर भी लौट सकते हैं। "
About Bharat Mata Rishi Arvind says, "हमारी माता क्या है? वह एक मिट्टी का टुकड़ा नहीं है अथवा एक शब्द या मन की कल्पना नहीं है। यह एक महाशक्ति है जिसे हम सब भवानी भारती के नाम से संबोधित करते हैं, तीस कोटि लोगों की जीवन शक्ति है, जिसे हम युगों से पूजते आये हैं, इसे उसकी प्यारी संतान देश भक्ति कहकर पुकारती है और जिसे आधुनिक भाषा मैं Patriotism कहते हैं।"
Everyone of us Sindhis should feel that it was not a partition of country but it was really that our Mother India was broken in pieces. Let us emulate the example of the Israelis who kept on repeating every year outside their country the words, "Next year in Jerusalem." "मुंहिंजी काया भारत में आहे। भारत जी संस्कृति लाइ मूखे मान आहे त गंगा, जमुना पवित्रु नंदियुनि लाइ भी पर महान सिंधु भी मुहिंजे लाए पवित्र आहे मां सिंधु खे विसारे नथो सघा। वेदनि में जहिंजी स्तुति कयल आहे अहिड़ी महान सिंधु जहिंजे किनारे ते फकीरनि ऐं सूफियुनि जो वासो हो हर रोज मां उनजो स्मरण कंदो थो रहा। भारत जो विराण्डो अफसोसनाक आहे।"
Shri T. L. Vaswani in his book "He walked with God" has said : "बंबई जे दरिया किनारे खां मां कराची जे सुहिणे बंदर जो दर्शन करे रहियो आहिया। मुंहिंजी अंतर आत्मा पुकारे थी, जेसताई हू पहाड़ अचल आहिन जेसताई ही ऊन्हों गहिरो समुद्र स्नेह जूं छोलियु छिड़काईंदो रहंदो, जेस ताई ही अजर अमर सूर्य प्रकाशमान रहंदो तेसिताई मां ईंदड वक्त में भारत ऐं पाकिस्तान जे बीहर हिक थी वजण जी उम्मेद छड़े नाथो सघा। मुहिजे मन में "हिक" जा वीचार फिरंदा था रहन। जेकडहे असी हिक राष्ट्र तोर उसररन चाहिंदा हुजूं त असां जी मंशा पूरे हिक जी हुजन घुर्जे।"
Shri Sadhu Vaswani has also written in his book Noori, "भगल भारत कढ़ाहे ठहंदो, वतन मुंहिंजो कढ़ाहे वसंदो"
Let us believe our Mahapurshas and hope that Bharat will be united again. I appreciate that you have added Sindhi Section also in your magazine. Regarding the poem "अमन जा सिपाही" by Shri Rochal Nagwani there is no doubt that we Sindhis are peace loving people but let us realise that terrorists of today will not allow us and the world to remain in peace. it is true that there will be no RAM or KRISHNA in Kaliyug but Sangeshakti will be the God's roop in Kaliyug it is therefore necessary to unite the society and the country.